Remove front pillar finishers (LH/RH). Refer to INT-24, "FRONT PILLAR FINISHER : Removal and Installation". Remove center pillar upper finishers (LH/RH). Refer to INT-28, "CENTER PILLAR UPPER FINISHER : Removal and Installation". Remove rear seat back. 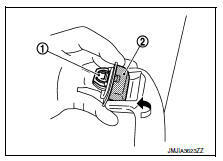 Refer to SE-23, "Removal and Installation - 60:40 Split Seatback". Remove rear pillar finishers (LH/RH). 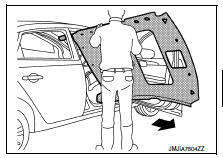 Refer to INT-29, "REAR PILLAR FINISHER : Removal and Installation". Release pawl of assist grip cap (1) using a suitable tool (A). Slide assist grip cap forward and remove as shown. Slide assist grip (2) forward and remove. 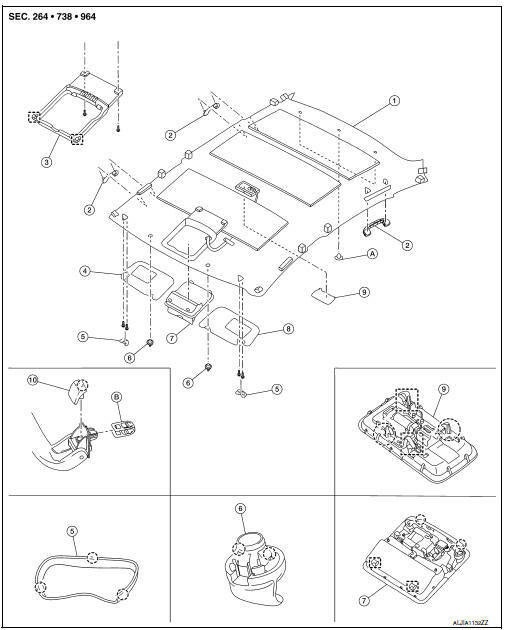 Remove metal clips from body panel. Remove room lamp. Refer to INL-55, "Removal and Installation". Remove map lamp. Refer to INL-52, "Removal and Installation". Remove sunroof welt (if equipped). Release sun visor cover pawls using a suitable tool (A), then remove sun visor cover. Remove screws and the sun visors (LH/RH). Remove all sun visor holders. Rotate 90В° and remove as shown. Remove headlining from roof panel as shown. 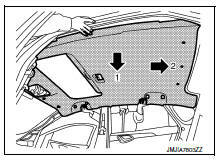 Adjust the position of headlining so that it can be removed through passenger side door. Two people are required for removal in order to prevent damage. Do not bend headlining when removing. Be careful not to scratch or damage any part of the body while removing the headliner. When installing headlining, start by installing both sun visor holders and the headlining clips in order to keep the headlining in position. Do not bend headlining when installing. Be careful that the surface is not wrinkled when installing. When installing assist grip, install metal clip (1) to assist grip clip (2), then install to the body panel.